Daniel Jacobs won’t be able to skip this second-day weigh-in. The contract for his Ring middleweight championship fight with Canelo Alvarez includes a rehydration clause, sources with knowledge of the deal told The Ring. A same-day weigh-in will be held at 8:00 a.m. the day of the May 4 fight in Las Vegas; neither fighter will be allowed to exceed 170 pounds for the fight contracted at 160 pounds. The penalty is several-hundred-thousand per pound over 170, per sources. Same-day weigh-ins are rare in boxing, though Canelo did have one for his May 2017 fight with Julio Cesar Chavez Jr. Fighters always step on the scale the day before their matchup — as Canelo and Jacobs will do that Friday where they must weigh no more than 160 pounds — but then they’re typically free to gain as much weight as they please after the weigh-in. 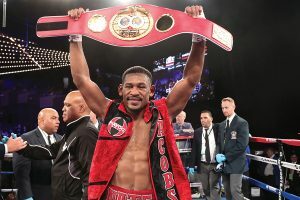 Daniel Jacobs earned the vacant IBF middleweight title with a hard-fought split decision over gym mate Sergiy Derevyanchenko. The clause in this contract is aimed at Jacobs, a middleweight with a large frame who’s the naturally bigger man. When Jacobs challenged Gennady Golovkin for his middleweight titles in March 2017, he elected to skip the IBF’s same-day weigh-in. The IBF is the only organization that stipulates fighters to step on the scale the morning of the fight. Jacobs wasn’t eligible to win the IBF title, but he didn’t mind; he was also fighting for GGG’s WBA and WBC titles. Jacobs now holds the IBF middleweight title after outpointing Sergey Derevyanchenko in October. Jacobs didn’t exceed 170 pounds for that fight during the same-day weigh-in. The IBF has abolished same-day weigh-ins for unification bouts since GGG narrowly outpointed Jacobs. That meant there would be no second weigh-in for Canelo-Jacobs mandated by the organization (as Alvarez also holds the WBC and WBA titles). However, both parties agreed to the condition during negotiations. The post Canelo Alvarez-Daniel Jacobs title fight contract includes rehydration clause, hefty fines appeared first on The Ring.